Nyctalemon zampa Butler, 1869, Ent. mon. Mag., 5: 273..
Nyctalemon crameri Boisduval, 1874, Revue mag. Zool. (3), 2: 441. Nyctalemon najabula Moore, 1877, Proc. zool. Soc. Lond., 1877: 629. Nyctalemon docile Butler, 1877, Trans. Linn. Soc. Lond. (2), 1: 562. Nyctalemon dilutus Röber, 1927, Int. ent. Z., 20: 429. Lyssa zampa Butler; Holloway, 1976: 86. Diagnosis. This and the next species are superficially very similar but can be distinguished clearly on a number of features. 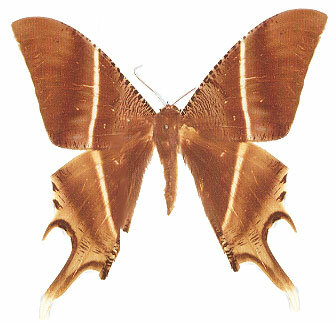 L. zampa has a paler grey brown zone (more definite in the female) immediately distal to the white bands on the upperside, and there are darker striae at the forewing dorsum distal to the band, absent in L. menoetius Hopffer. The latter however, has more extensive striae at the apical and dorsal angles of the hindwing. 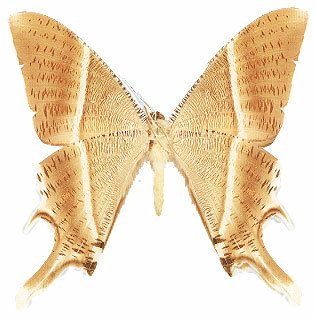 On the underside there is a more or less even dispersal of dark striae distal to the white band in zampa, slightly more emphasised on the hindwing. In menoetius this zone is unstriated on the forewing, and the hindwing striations resemble those of the upperside. Geographical range. N.E. Himalaya to S. China and Thailand; Andamans (ssp. docile); Philippines; Sulawesi (ssp. dilutus). Habitat preference. This species is commoner than its congener, predominating particularly in montane forests, being taken as high as 2600m on G. Kinabalu. Biology. 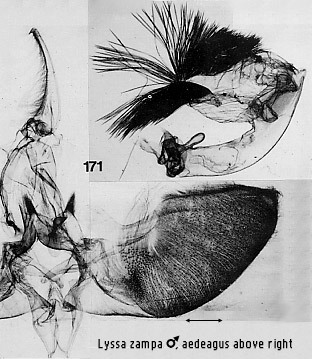 Barlow (1982) described the larva as yellowish white with reddish brown head and legs. It is illustrated above. Dorsally there is a series of tubercles and also a number of irregular but symmetrically placed black spots or pinacula that bear the primary setae. 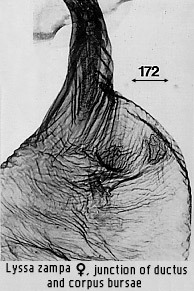 There are narrow, irregular, pale brown transverse markings on most segments, an effect augmented by strong wrinkling and definition of the segments. The spiracles are white, conspicuously ringed with black. Earlier instars have these markings more extensive and black, incorporating the black pinacula, and very young larvae have T1-3, A2, A3 and A7 more extensively, predominantly black, but still with a very irregular pattern. 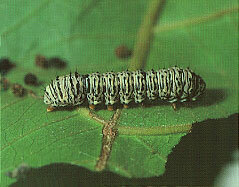 As the larvae progress they leave a trail of silk, and drop from the host-plant on this silken thread when threatened. 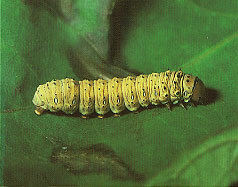 Pupation is in leaf litter in a silken cocoon between leaves sewn together. The host-plants are species of Endospermum (Euphorbiaceae): records (e.g. in Barlow) of Eugenia (Myrtaceae) have arisen through erroneous interpretation of the identity of 'E'. malaccense (Lees & Smith, 1991). 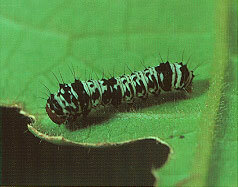 In Borneo the larva has been recorded and reared from E. peltatum (D.C. Lees, pers. comm. ).